for $479,000 with 3 bedrooms and 2 full baths, 1 half bath. 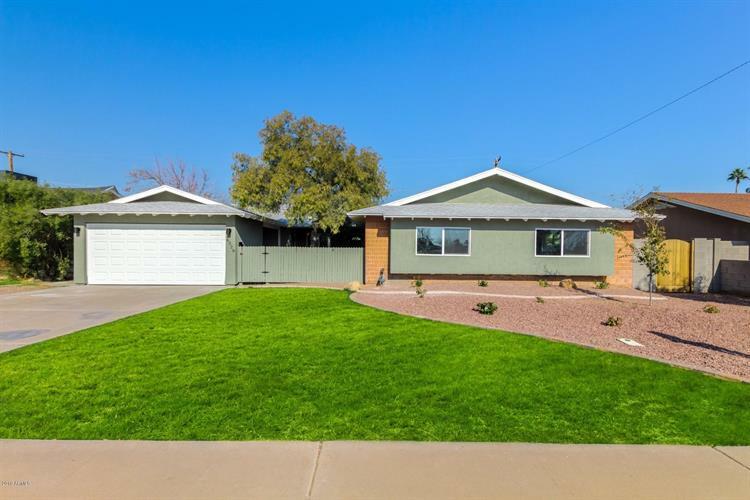 This 2,222 square foot home was built in 1960 on a lot size of 7614.00 Sqft. Smack in the middle of Old Town Scottsdale! This gorgeous remodel is located directly across the street from Hohokam Elementary School.The home has been remodeled through out with new roof, windows, water heater and new garage. Inside you will find new flooring (porcelain plank), shaker cabinets, grey Silestone counter tops, SS appliances, custom tiled showers and so much more. New french doors lead you out to the backyard oasis, complete with pebble tec pool, outdoor fire place with covered seating area.This wide open floor plan has 3 large bedrooms and plenty of living space in the great room and family rooms. Call your agent and see this one today!